Columbine leaves are typically divided into three-lobed leaflets which give them a delicate look. Anywhere from mid-June to early August, their flower stems reach up above the foliage with blooms that are either nodding or upright. Jones’ columbine is atypical with its compact leaves and short flower stems. Habitat: Columbines typically do best in partial shade with rich, well-drained soil. However, this plant is also known to grow in full sun under drier conditions. Columbines are popular perennials amongst gardeners thanks, in part, to their versatility and interesting flowers. Their availability in many colours is another winning attribute. If you are considering growing them on your property, why not try one of our native Canadian species. The stunning reds, yellows and blues of their flowers give a lift to one’s spirits as well as providing nourishment for hummingbirds and other pollinators. Wild columbines are easily suited to both formal garden beds as well as informal rock or woodland garden settings. They make an attractive combination with other woodland natives such as Solomon’s seals, foamflowers, Virginia bluebells or violets. They also look stunning growing in large patches all on their own. In her book Wildflowers of the American West, Rose Houk mentions that columbines were used in medieval times to ward off the plague, and that teas were made from the leaves and roots to help ease stomach upset and from the seeds of one species for headaches and fever. Wild columbines self-seed easily, but if you wish to help things along, gather seeds from your plants or from a reputable nursery (see our link for native plant and seed suppliers) and sow outdoors in late summer. If you wish to sow them indoors in the spring, stratify them first by placing in the freezer for about three weeks, in a container with a moist towel, although not everyone finds this step necessary. Plant them on the surface of your soil — do not cover as these seeds need light. Columbines typically do best in partial shade with rich, well-drained soil. However, this plant is also known to grow in full sun under drier conditions. The Calgary Zoo’s Botanical Garden grows A. canadensis in its rock garden. I myself have seen this species spread itself around my parents’ property in areas with shallow dry soil and full sun. It doesn’t get as large as those found in woodland edges or clearings with better soil, but it did well enough to catch my eye and incite an appreciation for its delicate beauty. Native to: seSask., sMan., Ont., Que., Nfld., N.B. and N.S. Appearance: Grows from 0.3 – 0.9 metres (one to three feet) tall with red and yellow flowers that are typically nodding. Native to: southern Yukon, B.C. and swAlta. Native to: B.C. and swAlta. Appearance: a pale yellow flowering columbine with long spurs, sometimes with a pinkish tinge, blooming from late June to early August. Nodding flowers. Appearance: a low-growing plant that reaches five to 12 centimetres tall, with leathery, hairy leaves that bunch together to resemble coral. It has only one or two short-stalked flowers that are a blue and typically face upwards. Native to: the Yukon, B.C., Alta., Sask., Man. and central Ont. 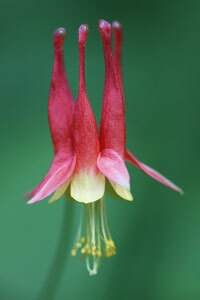 Habitat: This boreal forest species of columbine grows in rock crevices, meadows and open woods. Growing native plants can be both rewarding to the eye and to your wildlife neighbours, not to mention easy on your time and your well or water bill. ;Visit our Get Growing section to learn more about growing native plants in your garden. Find out who sells columbine seeds or plants in your region. Click on the “More Information” button on these web pages to find out what services companies provide, the percentage of native plants stocked, etc.